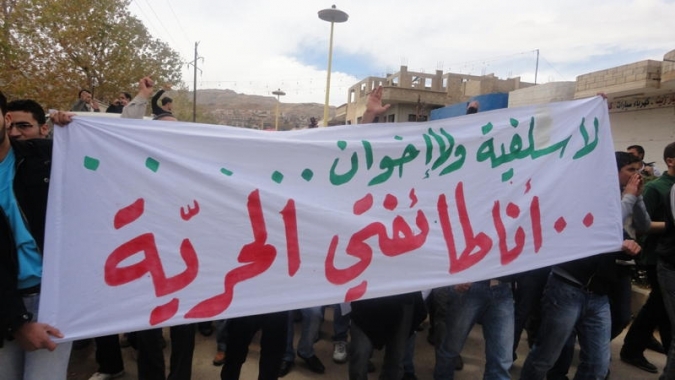 Protest in Zabadani: "My Sect is Freedom." The Syria Comment website is an indispensable source for news and views on Syria. Unfortunately, it now requires a health warning. This, as so often in recent weeks, is an example of Syria Comment taking leave of reality in order to slander the uprising. I’ve been following activist websites and facebook pages, and talking to Syrians of a range of backgrounds. I haven’t come across anyone who aimed to achieve a ‘confessional split’ in the army. Of course, the protestors wanted a split in the army, between patriots and the dogs of the state. They wanted Syrian soldiers to refuse to fire on unarmed Syrian people, and it seems in Dara’a they got what they wished for. Nobody wanted a confessional split. Next ‘shabeeha’ is not code for Alawis. I’ve heard Alawis talk about the shabeeha, and they’re not talking about themselves. The ‘shabeeha’ refers to a specific thuggish militia, which ran smuggling previously and breaks people’s heads now, while trying to spark sectarian fights. Syria Comment is dedicated to supporting the regime narrative while debunking and discrediting opposition claims. When it focusses on the supposed leaders of the uprising it offers up Ammar AbdulHamid, an expat Syrian linked to neo-conservatives, or bad-tempered Islamists. The intention is to show that the protestors are sectarian savages manipulated by the West. This approach doesn’t account for the Alawis, Ismailis and Druze opposing regime barbarity. Today the Assyrian Christian community threw its weight behind protests. I wouldn’t be surprised if SC now discovers that the Assyrian church represents the Salafi branch of Christianity. Syria Comment has also enjoyed mocking the international media and its reliance on eye-witness accounts and internet videos. Given that the international media is forbidden from reporting on events in Syria, and that journalists who do get in have been imprisoned, mistreated and deported, this mockery is in very poor taste. I posted a link on the site to a Robert Fisk report on Syrians fleeing state violence across the Lebanese border. Syria Comment then posted the statement on its main page “Robert Fisk is wrong.” Robert Fisk is often wrong, fair enough. Syria Comment’s reason for declaring him wrong in this case, however, was that ‘Aboud’ in the comment section said he was wrong. Aboud is a nickname like ‘Jack’ or ‘Jimmy.’ This is the site, remember, mocking the media for relying on eyewitnesses. Syria Comment has failed to report in any detail on protests, killings, arrests and sieges. Once it stated that no protests had taken place in Syria that day. A quick check of the internet showed that there had indeed been protests in several cities. But it gets worse. SC has taken to repeating regime slanders of opposition figures. Ayman Abdel Nour (of the all4syria website) for instance, was accused of visiting Israel in a trip organised by the PA’s corrupt strongman Muhammad Dahlan. The story is very silly, and very low. There’s also a facebook page dedicated to calling the brave activist Suheir Attasi a Mossad agent, and calling for her execution. Fortunately SC hasn’t repeated that lie. It has however allowed hate speech and even incitement to murder on its comments pages. Quite rightly SC doesn’t allow hate speech aimed against Jews or Arabs. But when those targetted are unarmed anti-regime protestors, the rules shift. So why has SC travelled so far from objective academic analysis? One possible answer was suggested by one of the SC crew, an expat Syrian who I had considered a friend. He emailed me accusing me of ‘flipping’ from support of the regime. Of course I haven’t flipped, because I was never committed to supporting the regime. I supported Syrian and Arab causes, and I still do. I support intelligence, which Hafez al-Asad demonstrated a great deal of. I oppose sectarianism, the eastern Arab curse. When I see the Syrian regime acting against the interests of Syrians and Arabs, acting with enormous stupidity, and doing its best to enflame sectarianism, then I oppose the regime, and in doing so I remain entirely consistent with my values. But this ex-friend by his language suggests that his loyalty always was to the regime, in a regime-right-or-wrong way if not in the payroll sense, and not to truth. Another answer has to do with sectarian prejudice. Joshua Landis married into an Alawi military family and unfortunately seems to have internalised some very ugly anti-Sunni attitudes. Years ago he wrote an op-ed for the New York Times which contains this little gem of a sentence: “For Mr. Assad to help the United States, he must have sufficient backing from Washington to put greater restrictions and pressure on the Sunni majority.” Chatham House’s Rime Allaf took Landis to task here for that article. I have to keep reminding myself that Joshua is almost Syrian himself, by marriage and by virtue of having spent years in the country. If I thought of him as an ordinary white American I would accuse him of racism. So I think of him as a semi-Syrian unduly worried by fears of post-Assad revenge against Alawis. These fears are legitimate. Still, it’s easy to find clear-sighted Alawis who fear sectarianism but recognise the brutal stupidity of the regime and the innocence of the protestors. Syria Comment remains a good and informative website. We link to it on PULSE, down there at bottom right. It’s a shame that it requires a health warning in these crucial times. Hello Qunfuz. I agree with most of your observations about Syria Comment and Joshua Landis. I gave up on Landis more than a month back, when he made the ridiculous statement about not knowing who was responsible for the massacre in Talbesi where 11 people were gunned down at a funeral. Landis is just an American face to the regime’s pathetic assertions that only Bashar can keep Syrians from killing each other. His “trusted Syrian sources” do nothing but reinforce the regime’s viewpoints. Landis is the only Syrian “expert” in the industry who seems to be clueless about the infighting that has occurred between the security services and the army. However, I was the one who posted the comment saying that Fisk was wrong about Telkelakh. I know so because I am in touch with people from Telkelakh on almost a daily basis. You are right that the name “Aboud” is a nickname. It could be Abdulrazaq, Abdulrahman, Abdulhadi, Abdulanything. Just because I use that name, doesn’t make what I know to be true, any less credible. Recently, Telkelakh was brutally attacked by the army. That wasn’t the case a month ago. I’m disappointed that Fisk would be so sloppy. thank you OTW, and thank you, Aboud. I’m sure you understand that I’m not having a go at you but at SC’s methods. I bet if you’d sent a report from Telkelakh describing regime violence it wouldn’t have found its way to the main page. The other thing is the irony – the media can’t be believed when they rely on eyewitnesses, but SC can. I find it puzzling, to say the least. Has the regime carefully provided informants for him? Or what? As for shabeeha. In aleppo, those who are described as regime shabeeha are all members of local sunni clans well known for their drug dealing and criminal behavior. They now form the backbone of pacifying the City of Aleppo. This little fact seems to have skipped Joshua. Ya 7eif. Joshua is a very decent fellow. I wish him the best, and I sure hope he realizes that his blog is losing credibility before it its too late. I have really tried to defend Joshua, although he never asked for it. Mine is also a nickname. I am not an eyewitness, and I have a similar stance to that of Qunfuz. I am sorry you object to the reporting on the revolution. I admit that I have not cataloged the demonstrations. I have copied Amnesty International reports on the murders and brutal suppression of the demonstrators. But it is in the comment section that readers will find a daily detailed description of each demo and videos to go with it. On occasion I have copied those lists to the main page, but if I tried to keep up with the various pages and copy their content, it would be an iposible excercise. I have tried to highlight all the main pages and activists who maintain web centers. You mention Ammar Abdalhamid, but I regularly push articles by Radwan Ziadeh, Ausama Mounajed, Najib Ghadban and most of the Western based activists who maintain the principle Facebook pages that have been so important to driving and shaping the message of this revolution from the outside. I know and admire Ammar, but I also admire the others, who have all played an important role in getting this revolution off the ground and have sacrificed a great deal to get it there. You accuse Ammar of being a neo-con, but he really isn’t. Most of the main activists have worked with figures from the Bush administration as well as the Obama administration. They undoubtedly believe that the revolution will need all the support of the US and Western governments to succeed. I don’t take a position on that. They have a strong argument. Whether it catches on with most Syrians, I cannot predict. Already, I suspect many are moving in that direction and welcomed Obama’s support for their cause and US sanctions on Syria. But I cannot tell. You are correct for chastising me for not monitoring the comment section more closely. I have let it get away. Many of the comments have contained insults and abuse. It has been from both sides. I banned the most vicious government supporter in the hope that it would set an example, I have censured and edited over 20 comments in the last week. But, please forgive me. I have not been able to spend a lot of time on it or read all comments this past two months. Some 200,000 readers came to SC last month. Daily posts were often getting 200 comments. I could not keep up and I abandoned my task as censure. Syrians are angry and frightened. Many have lost their cool and have been saying regretable things to each other. I try to maintain civility. I have often failed. I hope you will not blame that on me. Your main gripe has to do with my take on sectarianism. It is a common complaint. I beleive that Syria is a deeply sectarian society that is destined to become much more overtly conscious of the sectarian aspects of its society and polics. This regime, as we are discovering, is highly sectarian. It has tried to conceal it, but it is the reality. I will write about the Shabbiha and their origins in a post, hopefully shortly. There is no shabbiha milita. These are state malitias that have nothing to do with the shabbiha, who were mafia style groups connected to the president’s family under Hafiz al-Assad. The opposition has called them shabbiha, but they are technically not the same thing. They are part of the state and are Alawite. It is part of the sectarian strategy of the state. To overthrow this regime, the opposition will have to split the Sunnis from the Alawites, I suspect. The initial strategy, as you say, was to get the entire military structure to turn against the Assad family, as happened in Tunisia and Egypt. This has not happened and is unlikely to happen because of the sectarian strategy of the regime. I don’t think the Alawites are likely to split on this issue. The Sunnis may eventually split from the Alawites. If this revolution is to eventually be successful, my suspicion is that the opposition will have to use secarianism much more forcefully than it does today. I think that strategy will emerge soon enough, if it is not part of the unspoken subtext already. A subtext that sees Shabbiha as the main problem. I am preparing to write a post on sectarianism in Syria and how it is likely to become the main topic in the coming months, as it did in Iraq and Lebanon, once they began to move toward real conflict. During the first months of war in both Lebanon and Iraq, people did not talk much about sectarianism, but after 4 or 5 months, it was all anyone talked about. This is alreay beginning to happen in Syria. It is not the fault of the opposition. I am sorry if I suggested that. The regime is deeply sectarian. It uses the Alawite community and other traditional loyalties as a primary source of regime stability. If the opposition intends to break those loyalties, it will have to use them to its own advantage, which means ….., Well, we all know what it means. I do recognize the brutality of the regime. I also recognize the innocence of the vast majority of the protestors. Unfortunately, they will have to lose their innocence if they want to win. There will be much more brutality before we are through. That is my prediction. I do not welcome it. We are seeing the end of a post-colonial order in the Middle East. In the Levant that means overthrowing minority rule. The French and the British helped minorities to power in Lebanon, Syria, and Iraq. Since the beginning of the Lebanese Civil war, we have seen that order challanged by calls for democracy – in Lebanon when Kamal Jumblat demanded “one man, one vote” in 1975. In Iraq, when the US insisted on bringing democracy to Saddam’s world in 2003, and today in Syria, with the call of “Isqat al-nitham, hurriya, and demokratiya.” Each effort has involved a powerful undercurrent of sectarianism. They have been about overthrowing the minority religious community that has held the lion’s share of power for decades and more. The are intimately connected. About Talkalakh and Fisk. I would not have posted Aboud’s critique of Fisk if I had not had them corroborated by a US official, who has access to reports on the subject. Several people had pointed out to me in emails, that Fisk was wrong about a number of things in his first article. As for “the massacre in Talbesi where 11 people were gunned down at a funeral,” I wrote that I did not know who had gunned down the people, because I was finishing my post on the days events at 1:00 am in the morning in Oklahoma. I saw the first indications of the story. I wanted to include them in the post and did so but could say more. The next day, it became clear that the military had killed the 11. I did not know this when I published before going to sleep. When people read it the next day, some were angry, as was Aboud, that I had not nailed the government for the killing. At the time, I didn’t know. I would have loved to read your reply to Robin as a main post on SC. Along with Robin’s own post. There is an article that appeared today in Alquds, i think you should read.
. I do not agree with it 100%, but it is a decent read. I may have missed it, but the notion that sectarianism is the regime strategy has never been as clear in your posts as it is in your reply to Robin. I am though concerned that you think that the people of Syria would have to be more sectarian to remove this regime. This runs counter to everything i believe in and it really scares me. Please recognize that I have always argued that the regime is more clannish than sectarian. That said, my beef is not really with you. I have indicated a while ago that the regime supporters on your site are driving rational commenters away. Sorry to say it, but I can hardly distinguish some of these who I had much respect for from some of the jokers amongst regime defenders who appear on Aljazeera day in day out. The arguments are becoming stale and repetitive, the language thuggish, and the behavior is pack behavior. I have been posting really sparsely with the exception of last weekend. Again, with all regards and wishes that you regain some measure of control of your site. Glad to see your response to this post by Qunfuz. Lately, I started tuning to SC mainly because of its academic nature, hoping to get a different perspective on the events in Syria. However, I was put off by the Comments section due to the lack of civility, lack of objectivity, and outright viciousness, mostly by the pro-government crowd. I tried to post a comment on your website pointing out these problems, but it didn’t go through. I really hope you can do something about it. Dear SYR. <My policy is to let everything go through except personal insults. Thank you for your kind reply. I agree with you and I didn’t mean that you should censure all types of non-pleasant comments. There are few comments that include personal insults or insults to one’s God or faith that should not be allowed. As for lack of civility, this can be addressed by adding a disclaimer above the Comment field reminding people to be polite. Hopefully, over time, people get the message. Thank you for this overdue health warning. While Josh’s various postings may give the appearance of impartiality, there is a clear trend. There is a consistent attempt to minimize the scale of the protests, overplay the support that Bashar has among his citizens and magnify the fear of a sectarian apocalypse. It is distressing to see that, at least in the US, he seems to be the only “go to guy” for the media when it comes to Syria. Thanks for responding. I agree with OTW – you are much more reasonable here than on SC. The divergence is puzzling. First, about the ‘leadership’ of the uprising and the Western-based activists. I would suggest that these people are far less important than they or you would have us believe. Remember they tried to pull off a day of rage via Facebook and it fell completely flat. The first demonstration in Syria was in Hareeqa, Damascus, in response to police brutality. I wouldn’t be surprised if no-one in that crowd had heard of Ammar, Osama and the rest. The people in Daraa demonstrated when their children were arrested and beaten. And so on. The uprising was externally catalysed to the extent that Syria is an Arab country and Syrians were inspired by Arabs in Tunisia, Egypt and elsewhere, but the dynamics of the uprising have been internal. Therefore I would be much more interested in reading (on SC) interviews with representatives of the local coordination committees, or with activists on the inside such as Suheir Attasi or Razan Zaitouneh. I think these people are far more relevant. I agree that Syria is deeply sectarian, but I think that’s only half the story. Syria oscillates between sectarianism and a deep cosmopolitan civility which is millenia-old. The tension between the two trends determines the course of Syrian history. Your posts give the impression that the protest movement belongs entirely to the first trend. This is deeply unfair. The movement is much closer to the second trend. It also shows a development in Syrian nationalism. The overwhelming majority of slogans have been anti-sectarian. Kurds and Arabs, Muslims, Christians, Alawis, Ismailis and Druze have been involved in protests. The fact that violence and regime propaganda risks pulling Syria towards the first trend, and to civil war, makes the regime all the more culpable. Not only are they killing Syrians now, they are putting future generations at risk. The situation requires a clear apportioning of the blame. The best service we can do to Syria is to show honestly where the sectarian threat arises, and to show that it’s a power game, a trap the people should be aware of. When people refer to shabeeha they mean unofficial regime militias or thugs, the equivalent of Egypt’s baltagiyyeh. Most of them are Alawi, but as OTW’s comment shows, not necessarily. Your statement that shabeeha is code for Alawis distorts reality by suggesting that anyone who speaks of them has a sectarian agenda. I completely disagree that the uprising will have to become more sectarian to succeed. It may well become more sectarian as people become more embittered and despair of peaceful methods, but it will be less successful the more sectarian it becomes. A sectarian fight means civil war, not fredom. It means that Alawi intellectuals and Christian protestors will have to absent themselves from the uprising. Comparisons with Lebanon and Iraq are valid but should not be overemphasised. Shia were systematically discriminated against in Saddam’s Iraq in a way that Sunnis weren’t in Syria. Saddam was able to characterise the 91 uprising as Shia because the uprising – unlike Syria’s – was geograaphically limited. The people in the south saw Iraqi soldiers returning from Kuwait barefoot and semi-naked. People further north didn’t. Then the American dismantlement of the state opened the way for gangs and militias. This could happen in Syria if the regime decides that the entire state machinery must fall with it. Next, the final catalyst for civil war in Iraq was the contradictory responses of Sunni and Shia to foreign occupation. There isn’t going to be a foreign occupation in Syria. Lebanon’s war was always sectarian. At first it was a left/right thing, but the Muslims tended to be left and the Maronites tended to be right. Lebanon inherited a sectarian electoral system from the French, which poisoned everything. I agree with the final paragraph of your first comment. As for Telkalakh and Aboud, perhaps you should have mentioned, anonymously, your American source. You haven’t explained why SC repeated the slander against Ayman Abdel Nour. Several SC stalwarts have commented here in agreement with my piece. I hope it gives you pause for thought. Thank you again for your response. An Alawi friend of mine who supports the uprising emphasises how important it is that the protests remain peaceful and non-sectarian. He says that every day more Christians and Alawis are realising that they are not threatened by the uprising. If people start becoming more blatantly sectarian, minorities and secularists who are currently uncommitted will throw in their lot with the regime. Robin, It gave me pause. I admire your writing and passion. I understand your insistence that ideas and freedom, not sectarianism are at the heart of the uprising. Shabbiha, I would argue, does not refer to thugs. It refers to Alawi thugs who come from Qurdaha. That is the original meaning prevalent in Latakia and the coast, where they exploited their power in the 1970s through the 1990s. The fact that Sunnis can be thugs too, is probably true, but I have never heard of them called Shabbiha. Shabbiha was the term used for the privileged mobsters of Qurdaha who drove around in Mercedes 600 model cars during the years of the Lebanon Civil War. They got the Shabbiha name from the cars, because they looked like ghosts and because fancy Mercedes were cars only people with regime connections could drive in the day. See this article about Shabbiha that I wrote in 2004. Before becoming president, he led a steady and successful campaign to clean up the streets and local government of Latakia, the capital of the Alawite region. Latakia was traditionally known for its lawlessness and chaos. The shabbiha (young toughs and often Asad family members) had free run of the city. They regularly extorted money from local merchants, marketed smuggled Lebanese goods and openly carried automatic weapons about. They beat people up for unrecognizable slights in order to boost their profile and inspire fear. In short, they exhibited all the characteristics of a Mafia with few of its restraints. When Bashar inherited the mantle of power following his brother’s death in 1994, he waged a campaign to bring law and order to the Alawite heartland. He disciplined the Alawite ruffians and brought unruly family members to heel – in one incident, he personally had his cousin’s bodyguards thrown into jail for roughing people up. In 1996, thirteen of the nineteen Alawite professors at Tishriin Medical School were fired for corruption – a measure designed to show that the regime would neither play favorites nor protect fellow coreligionists at the expense of the law. Today, the city is a much tamer place than it was in the 1980s, which is due in large measure to Bashar. Great post, Robin. I agree with you. A real engaging dialog. Thanks Robin and Joshua. I am so happy to be guided to your blog, by no one other than you. I find this blog to be geared toward social justice. The neutrality comes from the way you chronicle the events, the action and reaction, from the onset. If my children are treated in this manner, adding that if I have the courage, I will act in the same manner, PEACRFUL PROTESTS. Knowing that for the past forty plus years, complaints fell on deaf ears and as a consequence, led to either incarceration or murder, and on many occasions collective punishment. Exile was an option for the more privileged. On the issue of sectarianism, “The fact that violence and regime propaganda risks pulling Syria towards the first trend, and to civil war, makes the regime all the more culpable.” is as accurate as any one can state. I can not agree with you more. Sectarian tensions are not unique to the Arab world, however, Bashar is an Alawite, and the majority of Syrians liked him, this is a proof that this fabric is not as sectarian, in my opinion. But the danger lies if this brutal Mafia chose the sectarian option, they will not wink “us or chaos”. I really liked Rana Qabbani description “Shabbiha of the pen” that Patrick Seale mentioned in one of his articles. I think that summarizes your comment. You are quite right that the original meaning of shabeeha was Alawi thugs from Latakia, and yes, it comes from the Mercedes shabha, or ghost. But the word is now used to refer to regime thugs. I’ve just checked with a few Syrian friends. OTW is not alone in referring even to pro-regime Sunni thugs as Shabeeha, although most are Alawi. In any case, your statement that shabeeha is code for Alawis is an innacurate statement. Is Salafi code for Sunnis? (amongst some pro-regime propagandists, yes, but not usually). Salafis refers to a tiny group of Sunnis. Shabeeha refers to a tiny group of Alawis, those who are involved in thuggish pro-regime activities. Does “young toughs and often Asad family members” mean all Alawis? Alawis themselves talk about the shabeeha, and they are not using a code word for themselves. This is a simple point and I’m surprised you’re having trouble understanding it. Your statement makes it look like everybody who complains about the shabeeha is an anti-Alawi sectarian, and this is an obvious untruth. Quite a pernicious untruth in the current context. another point about sectarianism. remember the fight bewtween Alawis and Ismailis some years ago in Masyaf (was it Masyaf?). There was a good piece about it on Syria Comment. Somebody at the time (perhaps Joshua) pointed out that the fight wouldn’t have reached the proportions it did if there had been respected civil society figures who could have knocked the young men’s heads together. But there weren’t any such figures, because any natural authority figure was perceived as a threat by the regime and had been removed. Masyaf is a microcosm of Syria. Syrians lived together even before the arrival of Al Assad family to power. Mind you, majority of Alawii are poorer now than forty years ago. You just need to visit any Alawii village (including Kurdaha) to establish that yourself..
To follow on from your comment Robin: In the eighties, the muslim brothers were threatening the peace of Latakia. One day, Alwaii groups were walking toward Sunni streets aiming for revenge. They faced a group of Alawii Sheikhs that were protecting the Sunnis. This stopped the potential civil unrest in Latakia in its infancy, nothing happened afterward. This is well known fact, you can ask about it..
What did the regime do for these Alawii Sheikhs in the years that followed? Well, Jamil Al Assad, brother of Hazez forced himself to be the head of the Alawii sheikhs and the Al Jaafari Association. He threatened and stopped anybody that refused. He even burned Alawii Mazarat to establish himself as the sole leader. Robin, Al Assad family are not able to understand that anybody else except them could represent Alawii… The original deal was that Hafez is the political leader, Rafaat was that the Army leader and Jamil was the Spiritual leader….There was no economical leader. For this position they appointed Al Makhlouf family…. I feel sick of writing and talking about this, It is obvious to me so much that I don’t know where to start from and why educated people such as Joshua are struggling to understand. I advice anybody that struggles to understand how Syria is ruled to watch “The God Father”. Syria in not sectarian. It has been made sectarian so some people keep their chairs. Al Shabi7a are originally the group of drug and money smugglers that worked with Al Assad family in Latakia. Mouhammed Al Assad (Sheik Al jabal) is one of their leaders, Fawaz Al Assad is another one. To be an Alawii is not a must to become a Shabeh, you just need to be loyal to the cause (smuggling) and the master. Iyad and Ihab Makhoulf used many Sunnis, Alawiis and Christians Shabi7a in the nineties to smuggle Damascene business men money to Lebanon and to steel Lebanese cars. Their network was discovered only when they stole Al Hrawai son’s car. Nowadays some of these Shabi7a thugs are coming from Al Skentouri and Al Slaybeh in Latakia. These are Sunni pockets. However, I believe that al Shabeha are the natural development of 40 years of the same ruling regime, the same as Salafis. Both of these groups are two faces of the same coin. They both came because of the regime!! The regime protects the minorities as long as they protect and defend him. The regime will use minorities to destabilize Syria way before they give up power. I feel that our duty as intellectual is to keep talking about national unity, to keep talking about Syrian population as a whole. We must avoid talking about sectarianism even if we see it happening in front of our eyes. The regime is not an Alwaii regime, nobody can convince me of that. Bashar is married to Al Akhras family, this family was prohibited from entering Syria before the marriage. This family agreed to be part of the ruling group, and so many other people did. Bashar didn’t marry an Alawii because he wanted to give a message to the sunni population not because he was in love with Asmaa Al Akhras!! Loss aversion is very prominent these days, people are worried and afraid from change. For this to change to happen, I think that the opposition leaders should assure minorities, they should make their agenda and themselves clear and publicly known. So many Alawiis hate the regime but they are worried that the majority will take revenge. Assure Alawiis and other minorities and you will see the difference. What happened to our parents and relatives in the eighties doesn’t need to happen again. The regime is willing to do everything to have the support and the endorsement of the silent majority. Only when the majority of demonstrations continue to be unarmed, the silent majority will start supporting them. There is one big difference between now and the eighties. The fear barrier is broken and no amount of killing will build it up again….